My husband and I have a Valentine’s day tradition of staying in and watching the goriest horror movie we can find. Romantic, right? I’m honestly not sure why we even celebrate, because we both think the holiday is ridiculous, but there’s something lovely about traditions. Especially weirdo, non-conformist, holiday traditions and spending it with the one you love. 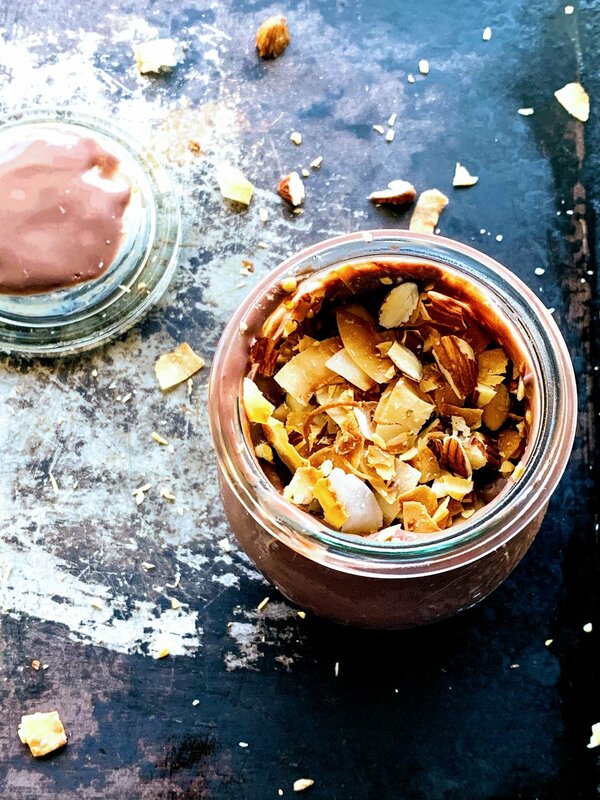 Last Valentine’s Day I came up with a recipe for vegan Almond Joy chocolate pudding, since we were smack dab in the middle of doing a Whole30. It was compliant to the rules of the diet, satisfied my sweet tooth, and was just as decadent as a traditional chocolate pudding. Vegan or not, this recipe is creamy, chocolaty, and full of coconut and almond flavor. So make this for someone you love, or eat the whole batch yourself. Because it isn’t a proper Hallmark holiday with out a bit of gluttony and self loathing. HAPPY VALENTINE’S DAY! In a large saucepan, combine coconut milk, dates, vanilla, almond extract, cocoa powder, and salt. Bring to a boil on medium to medium high heat, then reduce heat to medium low and simmer for 5 minutes. With an immersion blender, puree dates until there are no lumps and the chocolate mixture is completely smooth. In a large cup add arrowroot starch to almond milk and stir until dissolved. Add to chocolate mixture and stir to combine. Slowly bring to a simmer making sure to whisk continuously. If using the arrowroot starch, the mixture will thicken, but still look slightly runny. Don’t fret, the pudding will firm up in the fridge as it cools. Refrigerate for at least 2 hours to set. Spoon into bowls and top with toasted almonds and coconut.